For all inquiries about Crossdoku, you can contact us at email@crossdoku.com. 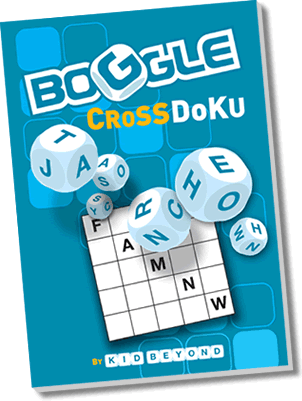 For inquiries about the Boggle Crossdoku book, including custom editions, special sales, premium and corporate purchases, contact Sterling Special Sales Department at specialsales@sterlingpublishing.com. © 2008 Kid Beyond. All rights reserved. CROSSDOKU is a trademark of Kid Beyond. BOGGLE is a trademark of Hasbro and is used with permission. © 2008 Hasbro. All rights reserved. Licensed by Hasbro.